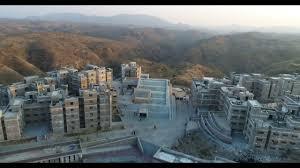 Hello Friends, today I am going to tell you about my college, IIM Udaipur. The one thing unique about the college campus is its beautiful design, with 7 proposed lakes within the campus and a state of the art 350 acres’ campus, it is poised to be the biggest and most beautiful B school campus in India when its construction is finished in 2020. The designer and architect of our campus, Mr. BV Doshi has been honoured with the Pritzker prize 2018 which is the highest international honour in architecture. The campus which is in its later stage of completion houses hostels which accommodate around 600 students, around 100 faculty members and their family. It has one giant lake right in front of the academic building giving a magnificent view of mother nature from each window in academic block. The academic building in itself is a magnanimous one with around 20 full size classrooms and few smaller ones along with an air conditioned auditorium and a plaza area for public gathering. Being an institute of national importance, the quality of education and academic excellence are the top priority here but that does not stop the students here from making the most out of our stay. We have a state of the art gymnasium with all the modern equipment. The library houses a vast collection of digital as well as printed resources. Udaipur is known as the city of lakes and our campus does full justice to the name of Udaipur by incorporating natural lakes in its design. Once finished the largest of the seven lakes will be opened for public visits and developed as a tourist attraction center. The life at a B school can be too hectic amidst the various assignment submissions deadlines, case study competitions and examination studies. But having a beautiful campus where you can relax with your loved friends and enjoy the best of beauty and serenity that nature has to offer does wonder in reducing all the academic stress. These are the places where memories of a lifetime are created. Aditya Birla group is one of the largest and most prestigious business conglomerations in India and as a b-school student, I have also dreamt of becoming a part of the esteemed group. I have a keen interest in finance and a background in banking thus I believe I would make a very good fit for the Aditya Birla capital and Aditya Birla Idea Payments Bank ltd. I am also very interested in marketing and operations function which makes me an ideal fit for working ithe n retail sector with ABG in ABFRL and ABRL.